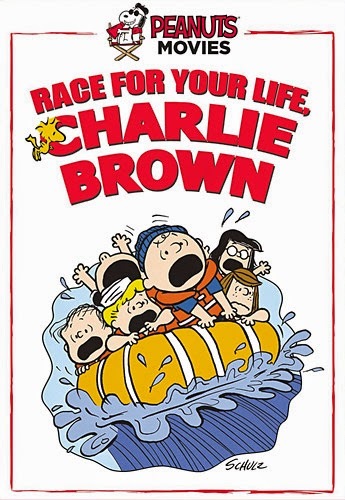 Race For Your Life, Charlie Brown DVD is now out! The much-anticipated DVD of the third Peanuts theatrical movie, Race For Your Life, Charlie Brown (1977), is now available. Released on February 10, 2015 by Paramount Home Video, the DVD presents the film in 16:9 widescreen, and the only bonus feature is the film's theatrical trailer. Interestingly - as was the case with the A Boy Named Charlie Brown and Snoopy Come Home DVDs - the Race For Your Life DVD actually shows less picture than the VHS release of the movie. The entire movie was originally drawn as a 4:3 (square) image, like the Peanuts TV specials, and that is what was released on VHS. When the movie was presented in theaters, the top and bottom of the image were removed, and the DVD replicates that 16:9 (rectangular) image. This is not necessarily good or bad, but just noting the difference, since typically DVD releases include more of the picture than the VHS tape. Regardless, it's great to be able to add a DVD with better picture quality to our collections. While there isn't a Blu-ray disc release of the movie to go with the DVD (alas), Race For Your Life, Charlie Brown is now available in high definition as a digital rental or purchase from iTunes or Amazon Instant Video (and possibly other providers). None of the other three theatrical movies are available as digital files at this time, although many of the TV specials are. While the initial announcements of the Race For Your Life DVD said that the fourth movie, Bon Voyage, Charlie Brown would also be coming out this year, so far there's no sign of it - no release date has been announced and no preorder listings have appeared. But keep your fingers crossed! The website ToonZone has an interview with producer Lee Mendelson about Race for Your Life, Charlie Brown in honor of the new DVD release. In related news, at the 42nd "Annie Awards" ceremony on January 31st, the International Animated Film Society (ASIFA-Hollywood) awarded Lee Mendelson the Winsor McCay Award for career contributions at to the art of animation, in particular, his work on the Peanuts specials. A justly deserved award, and you can watch the presentation and Mr. Mendelson's acceptance speech on YouTube. Finally, don't forget that Be My Valentine, Charlie Brown together with A Charlie Brown Valentine air at 8 PM (Eastern/Pacific) on ABC on Friday, February 13th, 2015!